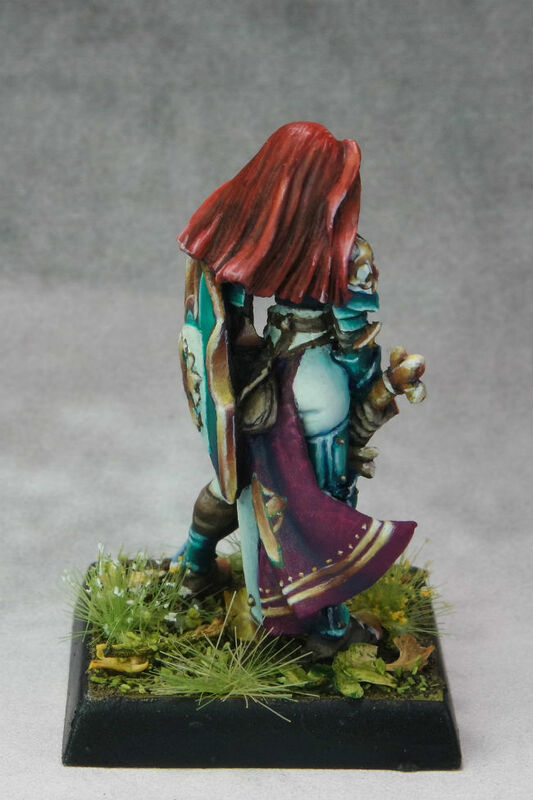 Here is a gaming standard commission I just finished. 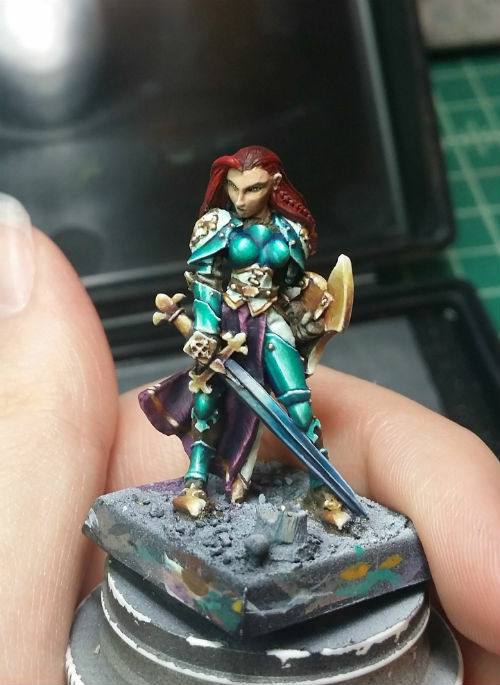 She was a lot of fun to paint. Before I started, I did a quick search to find picture of painted versions of her because when bare metal her face looked…wonky…and I wanted to have some idea of what I was dealing with. Turns out there are next to no painted pictures of her out there. It also turned out that her face wasn’t wonky! She just had an awesome smirk. It’s so hard to tell what things are sometimes when they’re shiny metal! Anyways, here she is. I hope you all like her! 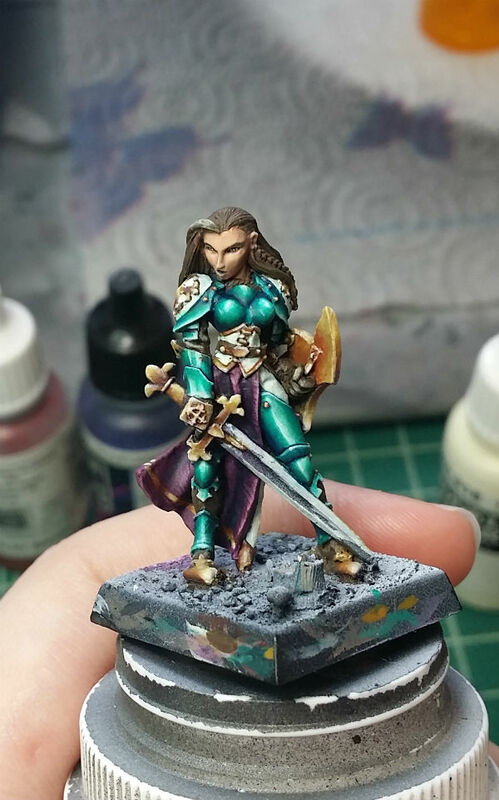 Time and practice can make a huge difference in your painting. 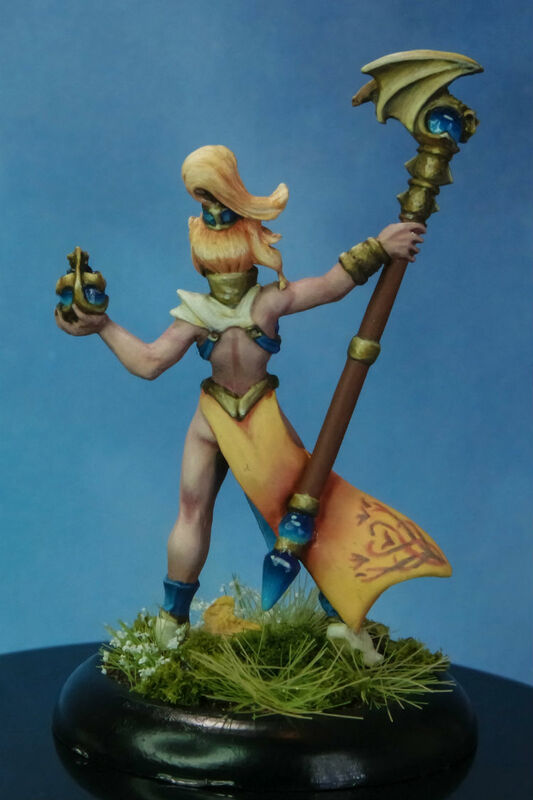 Today, I looked back at a model I painted about a year ago that I just painted another of. They are Reaper Finari. 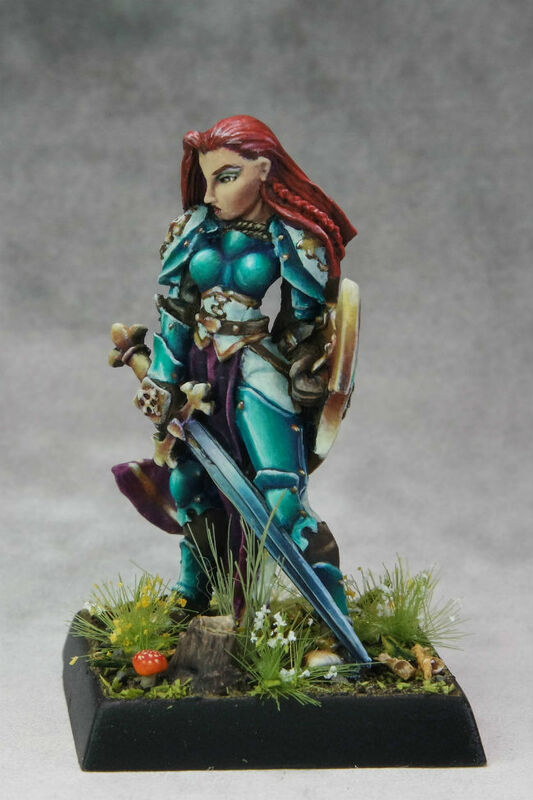 Although I painted another Finari in between them, it was a commission with a specific time budget and paint quality, and so it really can’t be compared. The yellow and blue Finari was painted in February 2014, and the teal and purple Finari I just finished in June 2015. 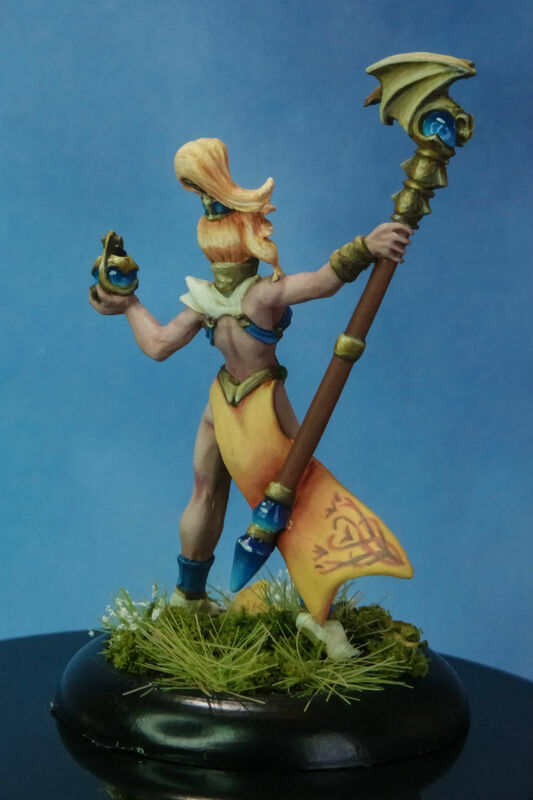 This model was such a blast to paint. 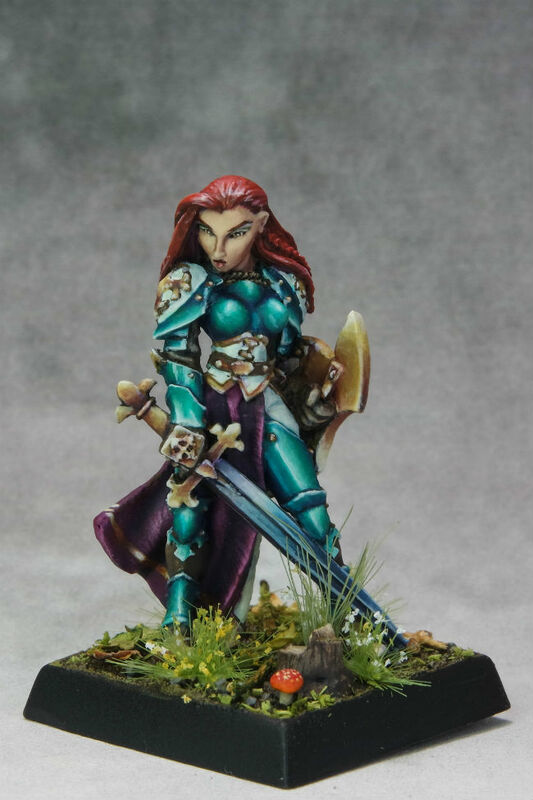 I’m sure I will end up painting her again down the road, but for now this is definitely my favorite version of her. 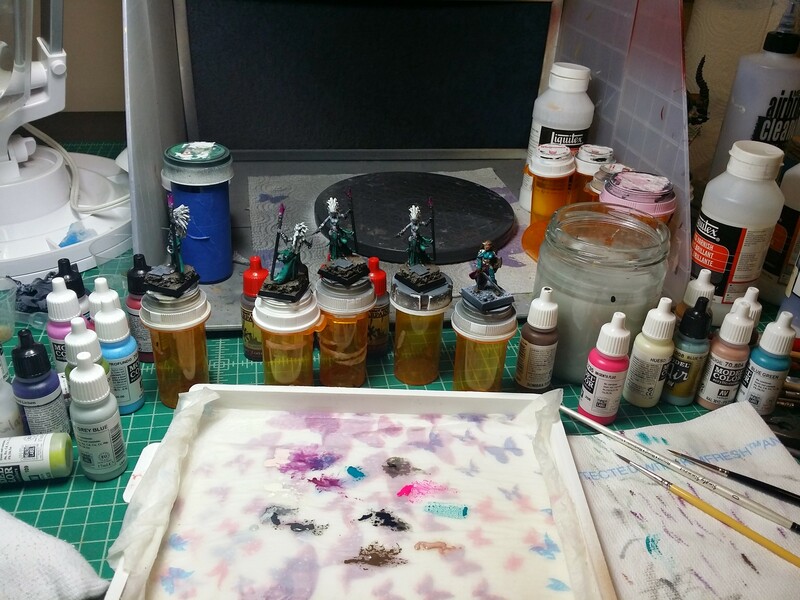 Here are more quick WIP shots of my Reaper Finari. I’m just trying out the red hair, not sure if it’s going to stay or not. 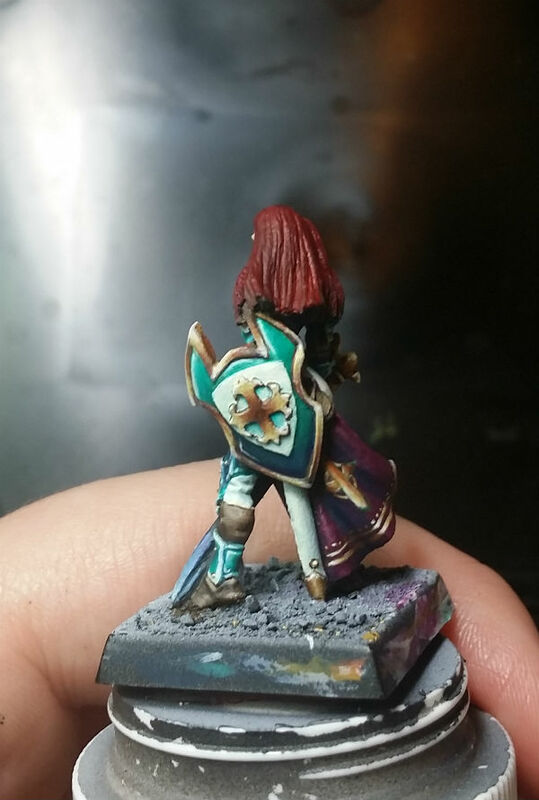 I’ve done more work on her teal armor, specifically making parts of the back shinier and adding reflected light. I’ve hit a point where for most of this model working on it further just feels like fiddling. Here are more WIP pictures of Finari! I’ve not been able to work on her so much in the last week or so because of the Kitsune, but now that that is done I think Finari will be the next finished. 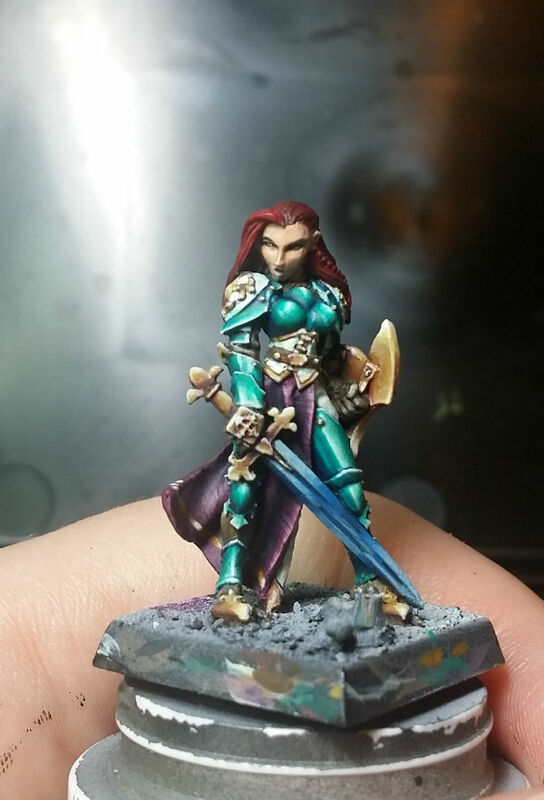 I worked on making her teal armor appear shinier, and I’ve worked on the NMM gold as well. I’m really enjoying the gold now that I’ve moved away from using a series of brown-ish colors. 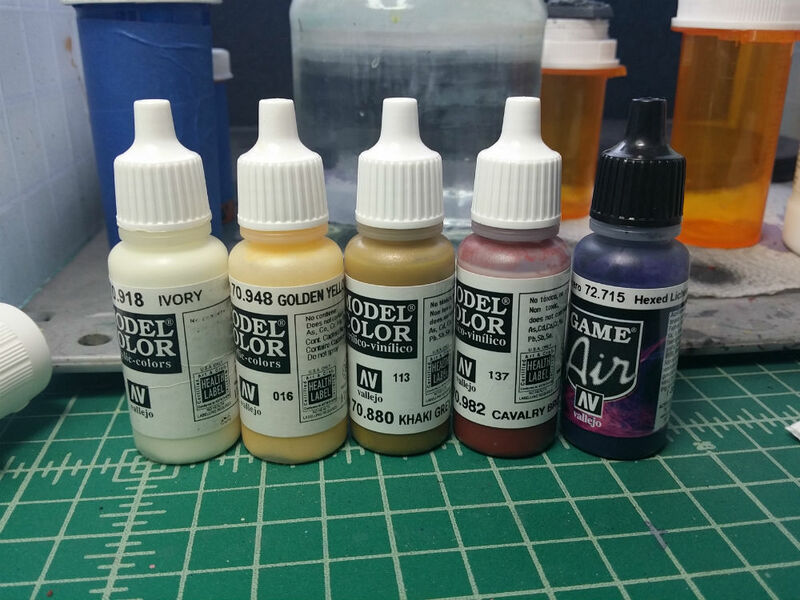 My colors on this NMM gold are a deep purple (VGA Hexed Lichen), a slightly earthy red (VMC Cavalry Brown), a greenish yellow ochre (VMC Khaki Grey), a pale yellow (VMC Golden Yellow), and my usual almost-white “white” (VMC Ivory). I feel like the gold is way more interesting. Also, in the case of this overall scheme, it plays off the purple cloak and teal armor very nicely. 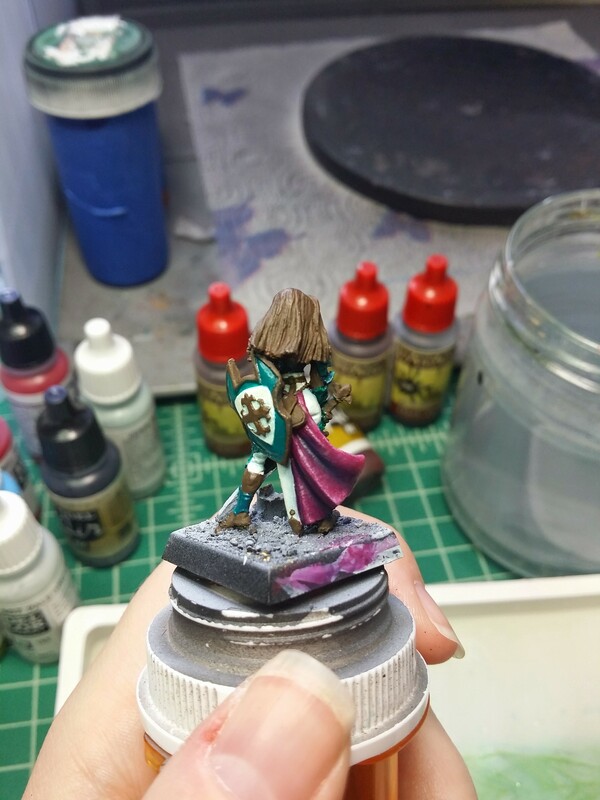 I’m still figuring out what I want to do with that cross on the back of her cloak, so it is nowhere near finished. 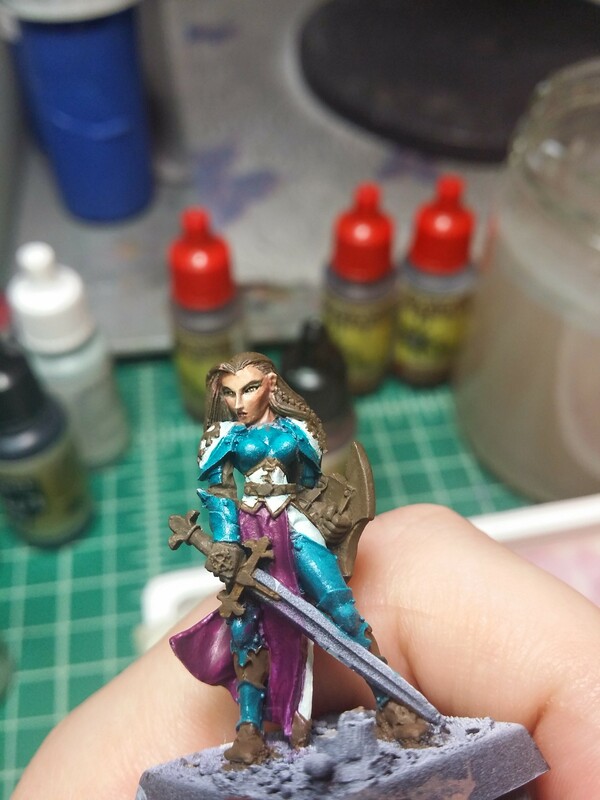 Here’s another WIP shot of Finari. 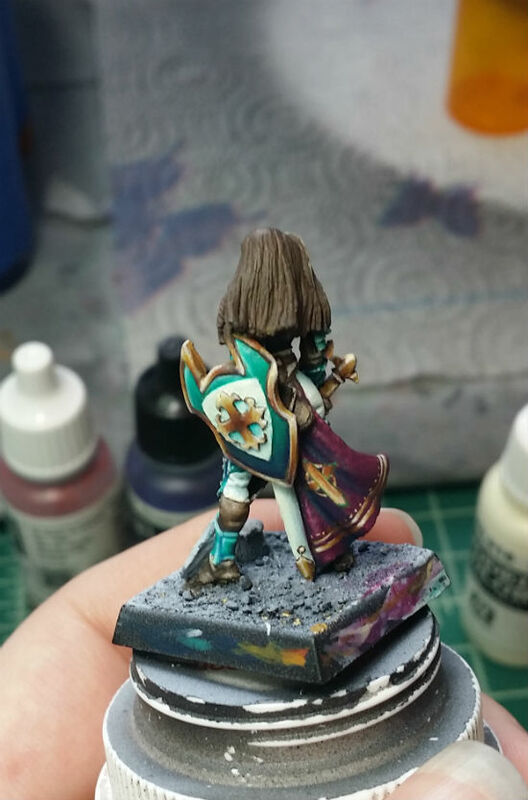 I will probably work on the cloak some more, but I’m really loving these colors! 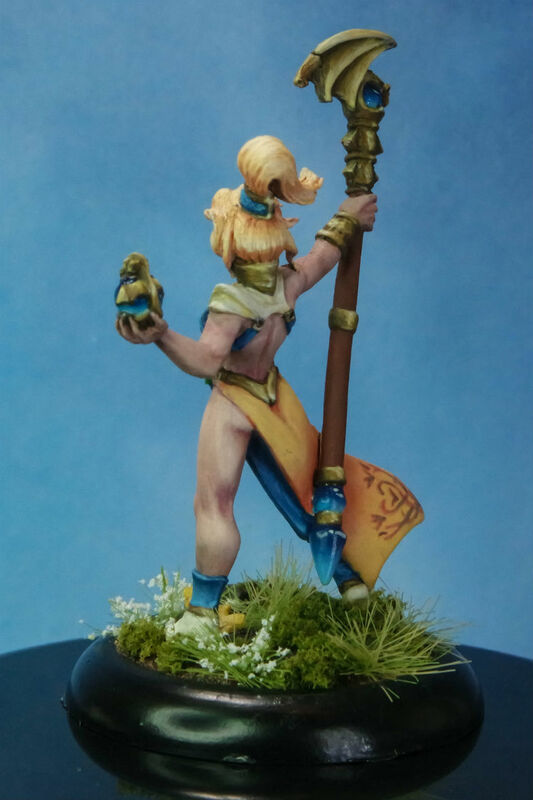 I’ve painted so many of this model now! I do love it though. It’s a great sculpt. I do have one complaint, however – every one of them has had a somewhat messed up mouth with some really rough metal on the side of her chin. 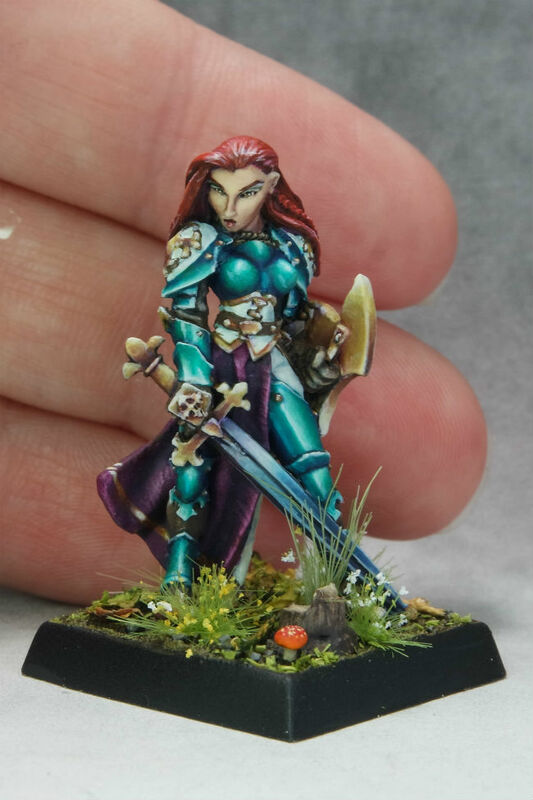 It really bothers me when a mini’s face is messed up. The face is the most important part! It’s mostly fixable, but I find it makes painting her mouth particularly complicated. Some Reaper Bones Dark Elves and a Reaper Finari on the way! I just switched to a wet palette, and I like it a lot more than the well right now. It definitely takes some getting used to, but we’re getting into summer here and it’s HOT. We keep the house warm to save on utilities, and my painting desk is in the room with the worst A/C, so it’s always several degrees warmer in here. 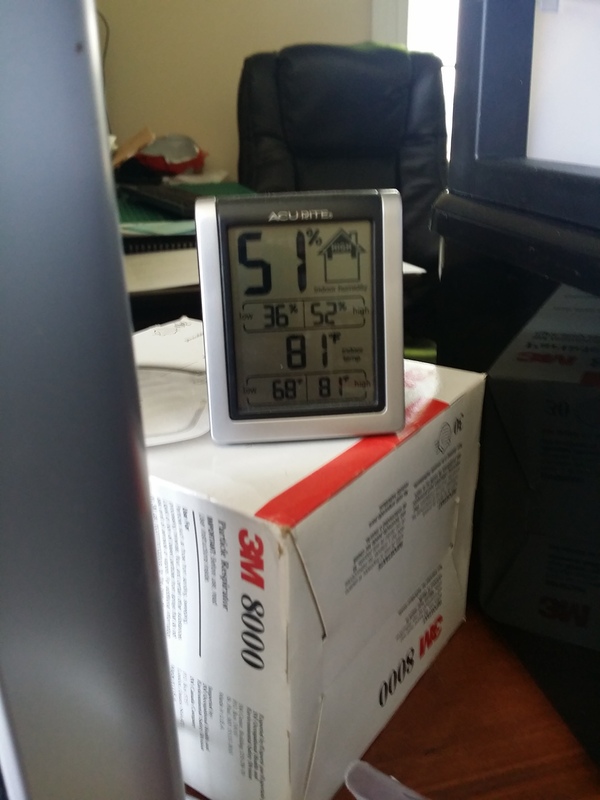 81 in here today while it’s 90 outside! That’s making my paint dry out FAST, hence the wet palette switch. Here she is finished! 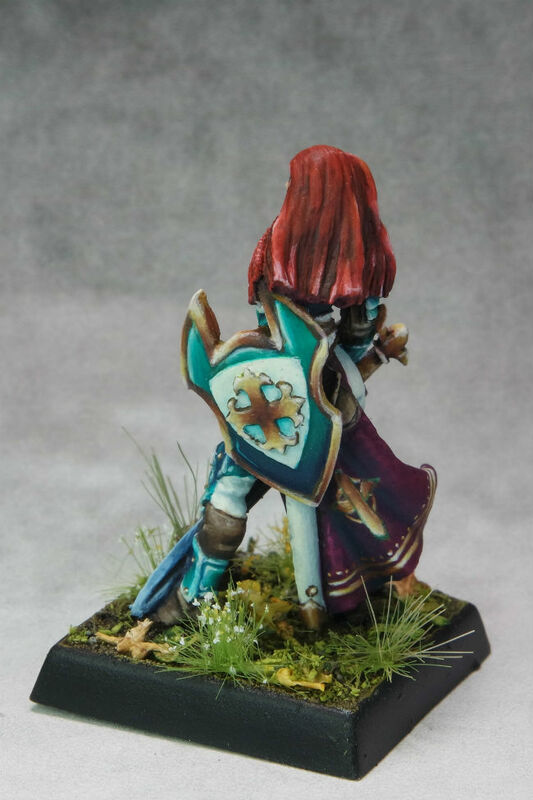 This was a really fun model, and I have several color scheme ideas for painting her again.